About two weeks before Christmas, someone asked me, “How do you do Christmas with quadruplets?” That was an excellent question. And one that I didn’t fully know the answer to at the time. I think I came up with some answer at the time, but now that we’ve done it, I’m really pleased with the way it turned out! First of all, I wanted to make sure that I put some things in place that could become a regular part of our Christmas celebration every year. I may not end up being a “cool mom,” but hopefully my kids eventually leave our home with lots of memories! Second, I wanted to make sure that I did some things to commemorate our first Christmas with the babies. We did our first craft project with the babies early in December. We have some ladies who have been at our house helping feed babies and keeping me sane every single week since they came home in May. They went so far above and beyond what they originally volunteered to do (they agreed to help once a week for a month and seven months later, they were still showing up!). This is what the babies made for them as a Merry Christmas/Thank You gift. Thanks to Beth P. for helping me (because this would have been nearly impossible on my own!)! I saw this idea on Pinterest and loved it! The idea is to take an ornament every year and write down the top memories, accomplishments, or milestones that your family experienced. When you take the ornaments out every year, you have a reminder of everything your family has experienced in the past. Since this was our “Babies’ First Christmas” I definitely wanted to give them each their own ornament. Being the frugal, sentimental, want-to-be crafter that I am, I didn’t want to just run to Walmart and pull four of the same ornaments off of the shelf. So we did these instead. Using the same paint that we used in their craft project, we had them put a hand print on each glass ball and then wrote their name on the other side. Thanks to my MIL for finding the clear balls. And, of course, there was the food portion of our Christmas weekend. In a nod to my childhood and heritage, we cooked a New Mexican Christmas Dinner when my family came over. We even included luminarias on the driveway! For Sean’s side of the family, we had the traditional meal and my MIL brought her pumpkin pie and homemade rocky road and haystack chocolates. You know it’s Christmas for the Ishums when those special items show up! I was also asked, “How do you do gifts for quadruplets? Do you just buy four of the same thing?” We didn’t. In August, I went to a consignment sale here in town called Just Between Friends. This is the mother lode of all consignments sales. I hate paying full price for anything, so this was exactly my speed! A little run through the clothes washer, dishwasher, or polish with a disinfecting wipe and those toys were as good as new! I spent probably $30-$40 on the kids’ Christmas gifts in August and didn’t buy anything at all for them the entire Christmas season. The kids got books, puzzles, Baby Einstein DVDs, and toys. This is definitely going to be my method of shopping for as long as I can make it work. (And yes, when I went to the Greater Kansas City Mothers of Multiples consignment sale in September, I bought their birthday gifts for February. So far I’ve spent $5 on that and don’t really see a need to buy anything else.) Gift buying may change in the future, but my kids are also going to grow up learning how to share. Although it’s important to us that they are treated as individual kids (they will always each get a gift from us) rather than a unit, they don’t all need the exact same item all of the time. The last thing we did to make Christmas special for our quadruplets was to keep them as close to being on schedule as possible. With various family members coming through our home for three solid days, it was tricky, but we managed to do pretty well. The kids were still exhausted by the third day, so I can’t imagine what it would have been like if we hadn’t tried so hard to keep them on schedule! 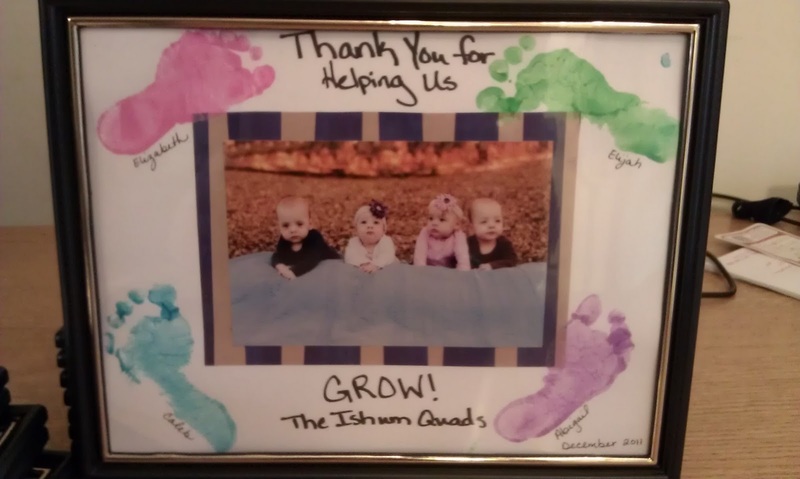 For our quads, a little, inexpensive, homemade Christmas went a l-o-n-g way! For kicks, I thought you all might enjoy this! A sweet friend made these awesome handmade washable wool socks for the kids. I lined them all up on the couch to take the photo. Cute photo, eh? But this is what it actually looks like when I'm attempting something like this. Hehe! Thank goodness for digital cameras! It takes what seems like a million tries to get a decent photo! And look what I caught Abby doing this week. Standing and only holding on with one hand. Yikes! Go, Abby! :-) And fantastic on Christmas, Becca. Visit coming soon! Love reading about your dear family! You are doing an amazing job. Your Christmas traditions are wonderful. Got me to thinking about next Christmas already!